Center large diamond type brilliant cut round triple AAA quality CZ is flanked by princess cut 2x2mm cubic zirconia round diamond is prong set in between 2x2 mm in prong setting. Other round clear white CZ set in double split rows on both side of the center stone. 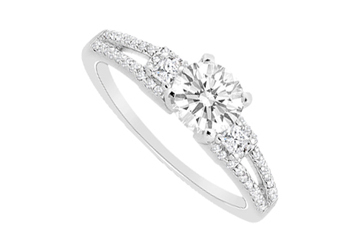 This lovely CZ ring has a total gem weight of 1 carat engagement ring crafted in 14K white gold high polished finish.